The first difference in using PayPal is the initial cost. Also, there are no monthly fees to have a PayPal account. The best thing to do is compare this to a merchant account. Based on your volume of business, you can decide which program is best for you! Transaction Fees: Start at 2.9% + $0.30 USD per transaction and go down from there. * Does not apply to Website Payments Pro or Virtual Terminal. Flat fee will be charged as follows: $0.30 USD for payments in U.S. Dollars, $0.55 CAD for Canadian Dollar, � JPY for Yen, �20 GBP for Pound Sterling, �0.35 EUR for Euro, $0.40 AUD for Australian Dollar. How is Eligibility for Merchant Rates determined? Eligibility for Merchant Rates is determined based on sales volume from the previous calendar month. To qualify for Merchant Rates, a seller must complete a one-time application and meet the Merchant Rate Criteria. Only you can make the decision on which service is best for you. Either choice is a step in the right direction. Being able to accept credit cards for your rentals will let your guest know you are professional and willing to accommodate their needs. More and more travelers are booking their trips with credit cards on the Internet. Don't be left out in the cold. 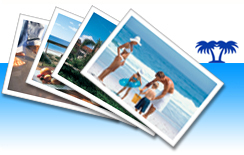 Once you have a PayPal account, just enter your PayPal ID, which is your email, into the Administration section in your ivacationonline.com account and your listing will be ready to accept PayPal payments for your bookings! It is that easy! When a guest books your unit, they will be depositing the funds into your Paypal account.